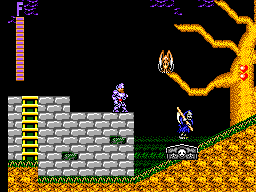 Ghouls 'n Ghosts is a conversion of the popular arcade game of the 80's. It's a run, jump and shoot type of game or an action platformer game that was released on a lot of other systems. The idea of the game is to save your princess who has been abducted by the evil Loki. It's a platformer game where you run to the right, take out the baddies with your lance and jump a few gaps here and there. If you see a chest, give it a few hits and see what comes out. If it's a wizard then kill him otherwise he will curse you with a spell. If a gateway appears, go in and see what you can get. You can only get one of the items at a time either stronger armour, faster shoes, a different helmet or a different weapon (including daggers, the discus and fireballs). When a new helmet is acquired, you get an upgrade in magic spells. To cast them, press the pause button to see what you can do. 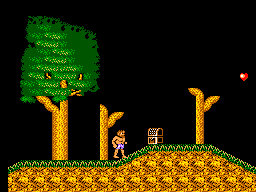 The graphics are very good on this Master System version of the game. They keep in the same style as the arcade, as do the enemies, so no faults there. Arthur is well detailed and animated too. There can be a little graphics flicker here and there but nothing major. It sounds like an arcade machine at home, well nearly. 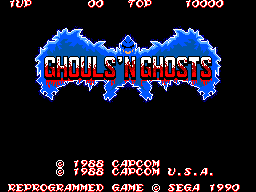 The music on PAL machines can sound slow but on a 60hz/NTSC machine it sounds very lively. The sound effects are good as well. It sounds like an arcade machine at home, well nearly. The music on PAL machines can sound slow but on a 60hz/NTSC machine it sounds very lively. The sound effects are good as well. This game makes good use of the jump and fire buttons. A good pad or arcade-type stick helps the arcade feel. As mentioned, the pause button is used to bring up an in-game menu. I have completed this game a few times and when I fancy a quick blast I pop this in. It's a very addictive game that plays very well. It's a great conversion of the arcade and compared to other 8bit platforms, it's one of the best with no waiting for loading. The best thing is that it is not an expensive game to buy either, so worthy purchase.